I went behind the wheel and drove north from Annapolis to Baltimore looking to find Obrycki’s Crab House (described in the book, “1000 Places to See Before You Die” as the “Crab Town’s Gold Standard”) to taste the best crab cake in Maryland. When we arrived in Baltimore, the GPS would not return any directions, it could not find the restaurant. We found out later that the place had closed. When I think of Baltimore, the Orioles and the M&T Baseball Stadium come to mind. However, Baltimore has a lot more to offer than baseball. 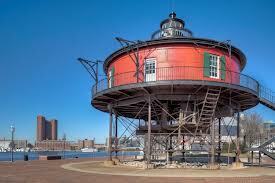 Baltimore is full of monuments, museums, galleries dedicated to the country’s cultural heritage and history. For example, the Old Baltimore Shot Tower – a red brick tower, Lloyd Street Synagogue – the oldest synagogue in the country (circa 1845), Washington Monument, the Basilica of the Assumption, and the house of Edgar Allan Poe. Unfortunately, we did not have enough time to explore the town’s rich history. I drove around town to see the building architectures and monuments from the outside. I continued to drive towards the bayside thinking that we would find a seafood restaurant by the wharf. After parking the car, we walked to the harbor only to discover an interesting shaped lighthouse. It was the Seven Foot Knoll Lighthouse. Little did I realize that the inner harbor is rich in history that dates back to 1600 when Captain John Smith explored the Inner Harbor (what was then the Patapsco River). We discovered many sights listed in the National Register of Historic Places (NRHP) and Baltimore National Heritage Area like the Seven Foot Knoll Lighthouse, USS Constellation and other historical ships. The city’s historical sights distracted me from my search for the taste of blue crab and the best crab cakes in Maryland. However, realizing that our visit was short, we took a walk by the waterfront and around Fell’s Point (the history goes back to 1700), content with viewing the city’s sights from the outside. The area was like any other US cities, it was alive with people who seemed to work there and few tourists, hotels and chain restaurants, coffee shops like Starbucks. We asked the parking attendant where we could find the best crab cakes in Baltimore. He mentioned two restaurants - Philips and Mo’s, and recommended Mo’s because it was local. He then gave us direction to the restaurant, but we got lost a few times. We wandered the streets and passed backstreets and alleyways of the old town and found the city’s charm in its brick buildings before finding Mo’s. As it turned out, Mo’s was located in the Little Italy area. The sign “MO’s” was outside the building, by the parking lot. We entered the gray building with a sea world mural and found a bar in the middle. It was unassuming and simple. We were ushered to the second floor. At that point, I did not care about the ambiance or the service. The crab cake was worth all that trouble we went through in finding the restaurant. The crab cakes were all huge chunks of blue crab meat, no fillers and baked to perfection. The fish and scallops were also superb. As we walked back to our car, about four blocks from Mo’s Restaurant, we discovered the Museum of Civil War. I must admit, History was not exactly my favorite subject in school. I came to realize, that if my parents took me when I was young or if I visited historical places in college I would not have struggled in that subject. I realized that by visiting historical places, we could envision their lives and daily routine and living conditions. It made the Asian proverb, “Better to see something once than to hear about it a thousand times” more meaningful. The visit to Baltimore and the Naval Academy and perhaps the Memorial Day holiday encouraged me to visit the National Park Systems that include National Battlefield Park and Site, National Historical Park and Ecological Reserve, National Historical Site, National Military Park, National State Park, National Scenic Trail, National Seashore, National Reserve, Scenic and Recreational River, National River and Recreational Area.